Tales of the Arabian Nights is a game by Z-Man that melds many of the fantastic tales found in 1001 Nights and the board games we have all come to love. It was one of the first games that I bought oh so many (2) years ago. 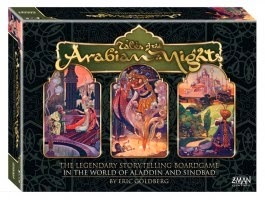 I've been playing board games for awhile, but Arabian Nights is really how my collection started. The box is beautiful, and it looks like an awesome coffee table piece. Z-man makes a ton of games that many people are familiar with (Carcassonne for one), but I wanted to start on the finge, and what I think of as one of their best products. Arabian Nights is a game that is dripping with theme, and (once you get the admittedly unweildy mechanic of passing books back and forth) as smooth as professional storytelling. The game starts by picking characters, whether it be Aladdin, Sinbad the Sailor, Ali Baba, or Scheherazade. Then you pick a number of skills that you wish for your character to have. These come in handy when navigating around the Arabian Peninsula. Finally, you pick two numbers that add up to 20, one of which is your Story Points, the other of which is your Destiny Points, values that you will increase in order to end the game. The mechanics of the game are really what makes it amazing. There is (almost) no dice rolling and few of the mechanics from Euro games present. 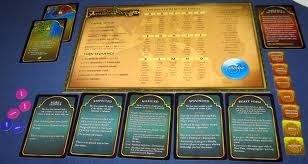 Instead you have a sheet of verbs on your character card, as well as some cards that may modify your choices that you will pick up throughout the game. Whenever you have an encounter, you choose a verb from the list, and then look in the MASSIVE 600 PAGE BOOK that comes with the game to see the outcome. 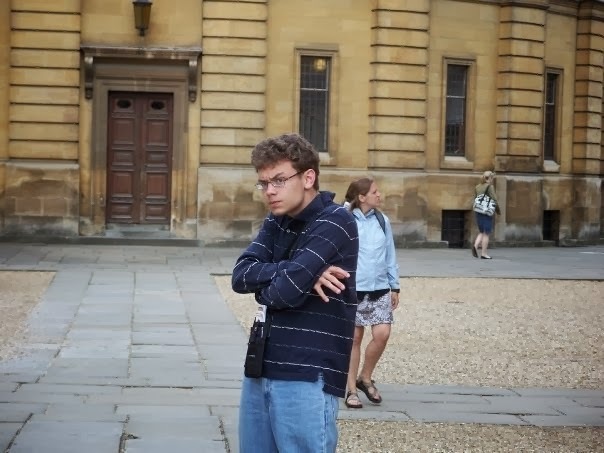 "I pulled a Destitute Beggar... (Looks on list)... I enslave him." Then we turn to page 445 and read a story about how this happens. While this may seem a little insane for a game (and it is at times, it takes some getting used to.) there are so many stories that it's near impossible to memorize what will happen in certain situations. On top of that, it gives the game ridiculous replayability. The breadth of the stories you enact make it feel like an epic story being told about your exploits, all from the comforts of your own home. Pictured: an epic journey not from the comfort of your own home. All-in-all, if you're in to storytelling, and you want a mechanics light (If a little unweildly at points) game. Arabian Nights is worth the 50 dollar price tag. Love the review - can't wait to play this! Sounds like a great game. With that 600 page book I wonder if there is a digital copy available. One of my college buddies owns this game and it's almost always one of the games we play every time we meet. It certainly does create some epic moments, like the game where I tried to use magic to fight an angry efreetah and ended up enslaved to her, used for menial labour, then killed. Or the one where my buddy was buried alive and murdered his way out of the catacomb only to end up swallowed by a sea monster.